Looking for some online poker action? 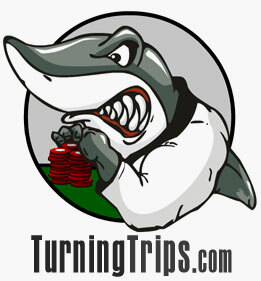 Turning Trips brings you information on the best and worst in online poker room action. Real room reviews from real players, including table previews, bonus information, and the straight goods on what you'll like and what you wont. Recommendations you can trust. Whether your favorite game is Texas Hold'em, Seven Card Stud, Omaha or even Razz Poker, we've got you covered! Learn how to play, where to play, and how to play better with poker reviews, advice and tips. Need a little help learning how to play a specific game? Click on the appropriate instuctions to the right for more help on getting started, then dive into some free games to try out what you've learned. Ready to jump right into a game? Here's our top 3 recomendations on where to play. Each poker room allows you to play just for fun or for real money. They don't offer one of the busiest poker rooms around, but have nice-looking software and great customer service, as well as good bonuses for new players. A fun place to play Texas Holdem on lower limit tables and respectable tournament action. A strong addition to the OnGame network, offering plenty of active tables ans fun special events like celebirty knockout torunaments. New players get to choose your own bonus with terms best suited towards their play - very neat. Party Poker is an absolutely massive room - its not uncommon to see more than 50,000 players online at any given time. Fair rakes, good game diversity (although no 5 Card Stud), and because of all the players it's always easy to find or fill a table. * Please check your local gambling laws and regulations before playing poker online for real money. Not sure where to play? Compare venues below with our real reviews from real players. If it didn't fit in neatly above, here it goes.